The feature you have all been waiting for is finally here. 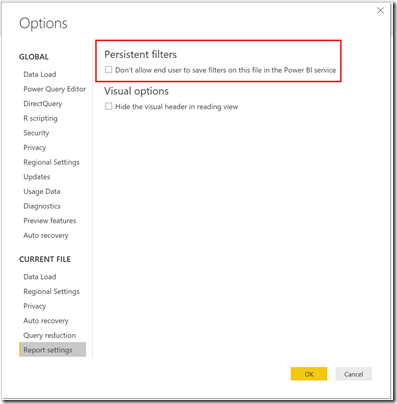 Today, I’m thrilled to announce the general availability of persistent filters in the Power BI service. All Power BI reports will now automatically retain the filters, slicers, and other data view changes that you have made. That’s right – you no longer need to spend your valuable time slicing and dicing your report and repeating the same steps each time you return to the service. With this feature, you will be able to pick up right where you left off last time and quickly get to your insights! 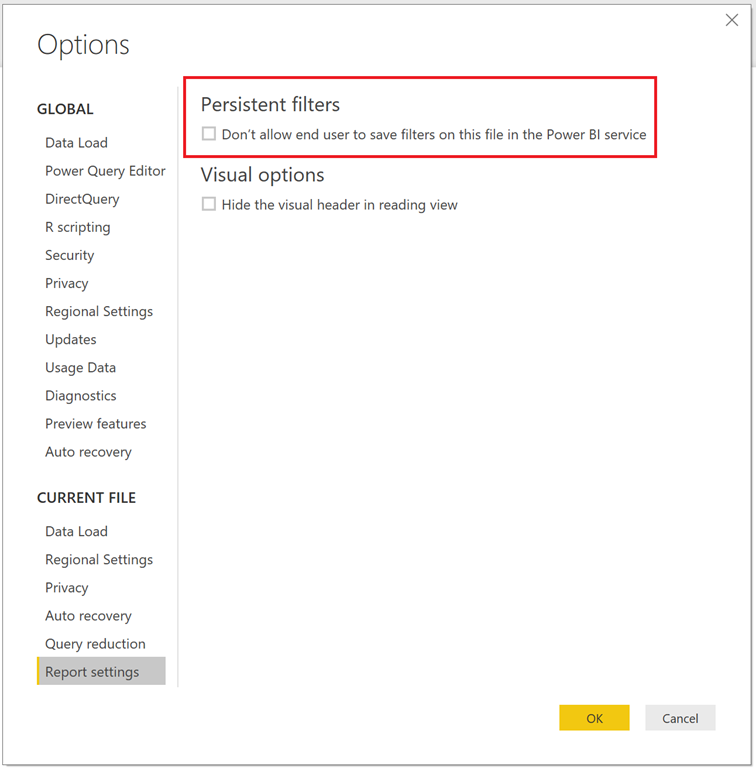 To see persistent filters in action, simply head to any Power BI report that you have view or edit access to. You will notice a new button on the top bar that says “Reset to default”. By default, this is disabled. It essentially means that you are viewing the author’s published view of the report and have not made any changes. As soon as you interact with the report (e.g. applying a filter or slicer), the button will light up and you will see the reset icon turn yellow. This is an indicator that the report is not in the default state and you have made changes. Note: If your button remains disabled, it either means the report author has disabled the feature for the report (see here for how). Once you have modified the report to the view that you like, simply navigate away to another dashboard or report that you have access to. Soon after, go back to the report that you just modified. You should now see a tutorial dialog pop up (only on the first run for each report) that gives you a heads up that all the changes you made last time has been saved. Tip: Returning to the report will always start you off on the default page set by the author. And that’s it! Your report should be in the same state as it was when you navigated away. 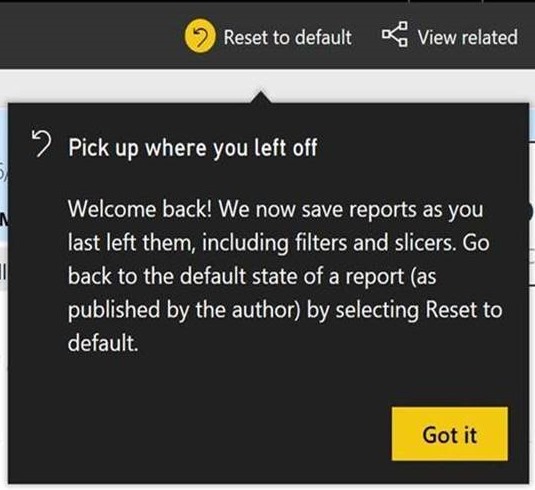 If at any point you want to return to the author’s published version, just click on the “Reset to default” button and hit yes to the dialog below – your report should be back to original. Update: Custom visuals are now supported. We heard your feedback and have since implemented custom visuauls for Persistent filters. Persistent filters is turned on by default for all reports. However, there might be some scenarios where reports are not completely optimized to leverage this feature. Which is why we added the control to disable persistent filters for reports in last month’s Desktop release. 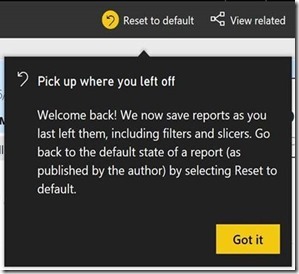 You can find this control under the Report settings option on Power BI Desktop, where checking off the box will turn off the feature for that particular report in the service. As always, we appreciate your feedback on new features. If you have any comments, questions or concerns, please feel free to leave a comment below, or in the Power BI forums.